Conceived by expert aerial choreographer Vicki Amedume, What Happens In The Winter is a tale of two women reaching the winter of their lives, their stories unraveling through a mix of aerial circus, text and dance. The production takes us through their life choices as physical artists and women, and explores how they navigate getting older in a career and a culture which idolises youth. In the wake of London 2012, where athletic bodies, strength and physical challenge were the darlings of the national media, the piece takes a wry and poignant look at what happens once that strength and spotlight have faded. WHITW is performed by Lindsey Butcher and Ann Dickie, and is based on their real life stories of love, loss and performance. It has been created with acclaimed theatre director Gemma Fairlie, and with text by Sonia Hughes. 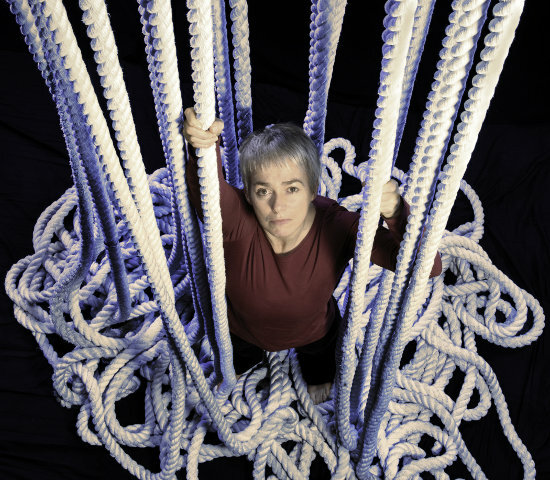 The production is accompanied by a series of participatory sessions that invite older members of the audience to explore circus skills in workshops. Upswing has always engaged with marginalised groups through circus skills, and carried out research for WHITW through a programme of work in partnership with Entelechy Arts, working with groups of older people. A 4m diameter raised ring rostrum (400mm high) centred underneath the truss raft flanked by two ballet bars. The ring is filled with rubber bark, with the whole arrangement sat upon a dance floor. Require suitable rigging points (4) to support a truss raft 2m x 1.5m centred left right and ideally 4m from the downstage setting line. This raft needs to be tensioned from below (either to other rigging or floor points/ballast depending on venue).